Today was one of those days. Just an hour to two too long. You really need some good food to get your groove back, but there’s not much at home, and being 830pm and living in a “trendy” part of town–you probably shouldn’t be biking about alone (it’s not quite to super-bike-friendly territory here yet). So you go home. and there are plenty of trashy tv shows on DVR. but you really need something delicious for your belly. so you pull out peanut soup. which starts with onions and butter (nothing smells better. nothing). In a large saucepan or soup pot over medium heat, melt ¼ c butter. 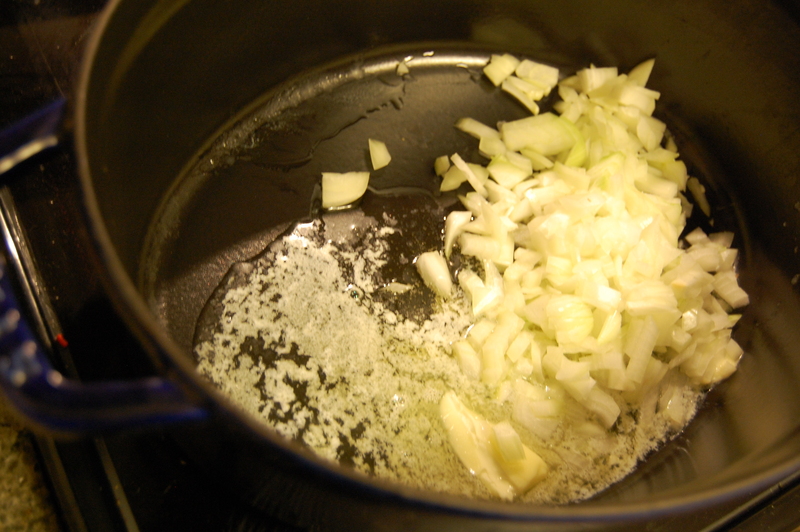 Add 1 finely chopped medium onion and two ribs of celery, finely chopped. Cook, stirring often, 3-5 minutes, stir in 2 T flour, cook 2 minutes, pour into 8 c chicken stock, bring to boil. Reduce to medium and stir often till thickened and reduced, about 15 minutes. Blend with immersion blender. Whisk in 2 c peanut butter and 1 ¾ c cream. Cook 5 minutes, do not boil. Serve warm, garnished with peanuts. I only had a splash of cream, but to me, it was just as good, if a bit less-thick. This entry was posted in food, Recipe and tagged Family, keepin' it real, life, recipe by Emily. Bookmark the permalink.